Apparently, Facebook has decided to move this feature. Thank you to Ki – one of the readers here – for pointing this out to me. Facebook Fan Pages are a powerful way for any business, product, or service (any brand) to build a strong presence on the web! Before I tell you about the Fan Box, let me quickly mentioning the exposure potential that Google search results is now providing for Facebook Fan Page owners. Many people don’t realize yet, but Google is actually crawling and indexing Facebook Fan Pages. 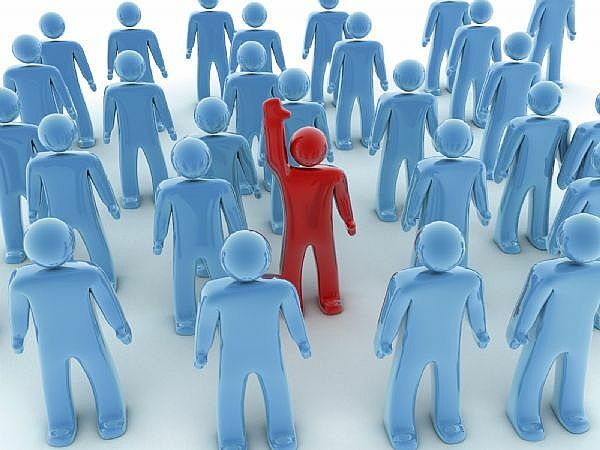 This means that not only are you able to be found by the 300 million users on Facebook, but you can connect to the hundreds of millions of people searching on Google each day as well. The benefit of the Facebook Fan Box is the viral exposure piece. Take this blog for example. There are over 230 blog postings, all of which are crawled, indexed, and available to be found in Google search results for a wide range of keyword phrases. Just look to the right and find the “Facebook Fan Page” Fan Box – it’s the one showing 8 Facebook fans (2 rows of 4) and if you are not yet a fan, you’ll see a “Become A Fan” button. The powerful thing here is that my Fan Box is exposed on every single page within my site. That includes all static pages, and all 230 plus blog postings. Now here’s how you grab the code and embed in other sites. Of course, you have to own other sites, or know people that would allow you to embed your Facebook Fan Page. What I recommend, is you start your own blog and build your platform for your business. A platform that you own 100%, and your business is the only one that is marketed upon it. 2) Once you click “Add Fan Box to your site”, you’ll be taken to a dashboard page. Notice the options that you have: 1) Chose your Fan Page (if you admin more than one page, the drop down will show the pages to chose from) – also, notice that you can select to include “stream” and “fans”. Go ahead and click those on and off and notice the change in the fan box on the right. Basically, you are deciding what content to include in your Fan Box. See the image above of my Fan Box – I’ve included only “fans”. 3) Next, in section #3, you have the pre formatted options to embed into Blogger or Typepad. For me, since I have a WordPress blog, I choose “Other” which then opens up a new box underneath with a snippet of code. 4) To embed the Fan Box into something other than Blogger or Typepad, click in the box with the snippet of code, hit “control C” (copy) and then “control V” (paste) to add the Fan Box into your desired blog or website. And that’s it – once you have the code embeded into your desired site, just publish your changes and then make adjustments as necessary. As I mentioned earlier, I strongly recommend you start a blog for your business, products, or services. 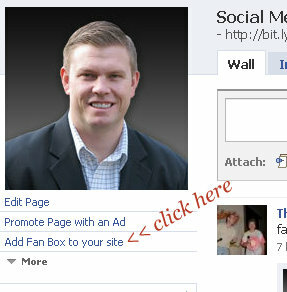 And in my opinion, a blog creates the best platform for marketing your Facebook Fan Page. If the Fan Box is placed into the side bar of the blogs mentioned above, you’ll present your Fan Page directly to every visitor to your blog, regardless of what page to visit. And the most powerful element is the “one click join” feature. This means that if a visitor to your site is not yet a Fan of your Facebook Page, they will see the “Become a Fan” button, and all they have to do is click it once and then they instantly become a new fan. 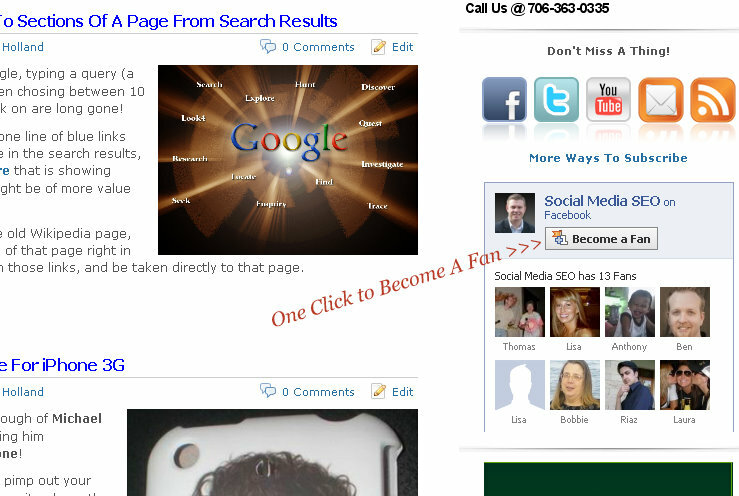 Go ahead and start your blog, create your Facebook Fan Page, and get your Fan Box embedded. 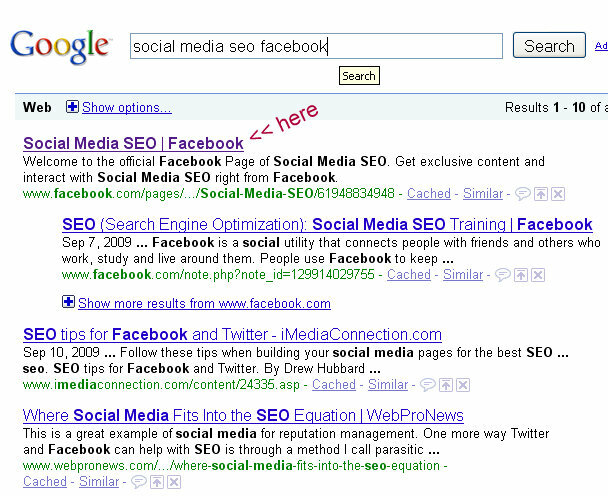 You’ll soon start growing your presence on Facebook AND in the natural search results of Google! All of which will deliver highly targeted traffic to your website, and highly targeted exposure for your business, product, services, and brand. Thank you, Robert. I just published a fan page and am looking forward to getting the 25 fans so that I can create and use a badge on my website. I see that my fan page is visible by going to the info tab and then “pages,” but people have to click “see all” to see my page, because I’m a fan of over 20 pages right now. Also, I was able to post my page to my profile, but it’s farther down now because I’ve posted several other things since then. Is there a way I can have the link to my fan page display prominently (and permanently!) on my profile page where people don’t have to search for it? @Thomas Morgan – Hi Thomas – absolutely. We have recently figured out how to add html code to personal profile pages. So we’ve built a “Facebook Fan Page” replica image that fits nicely underneath your Facebook profile friends on the left side bar of your profile, and again, a custom image that is present on the tabs of your personal Facebook profile. This customization now allows you to promote your Facebook Fan Page to everyone who visits your FB Profile, and it’s a great way to drive visitors from your profile to your Fan Page. Additionally, we’ve built s custom “call to action” banner image, along with a default landing tab for “non-Fans”, so when people go from your personal Facebook Profile to your Facebook Fan Page, they are sent first to a custom landing tab in your page with a call to action image to join your page. The results for us have been amazing, and we’ve seen more than double fan growth with our page since implementing this. Visit my profile ) and see the image right below my “friends” box to see what I’m talking about > also, go ahead and click that image and you’ll see what happens when you’re sent to my Fan Page (that is, if you aren’t a fan currently – if you are, you’ll just go to the wall). Also, on my profile, look at the tabs and click on the one called “Profile HTML” and you’ll see the other custom image that drives traffic from my profile to my Fan Page. Thanks so much Thomas for visit and commenting – it’s great to hear from you! This option doesn't not seem to be there anymore? Has it moved? Hi Ki – you are right, this option has been moved. I didn't notice this before because I already had a fan box on my site. Thank you for pointing this out! For some reason they moved that option. But thank you again for pointing it out, and I hope the instructions I gave above help you find your Fan Page box!